1. Preheat the oven to 220ºC, gas mark 7. Place the fish fingers on a baking tray and bake for 14 minutes. 2. Meanwhile, cook the noodles in boiling water for 4–5 minutes then drain. 3. Heat the oil in a frying pan and fry the vegetables for 3 minutes then add the sauce and noodles and cook for 1 minute. 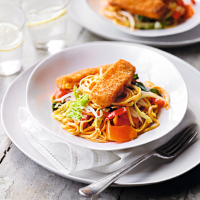 Serve topped with the fish fingers.